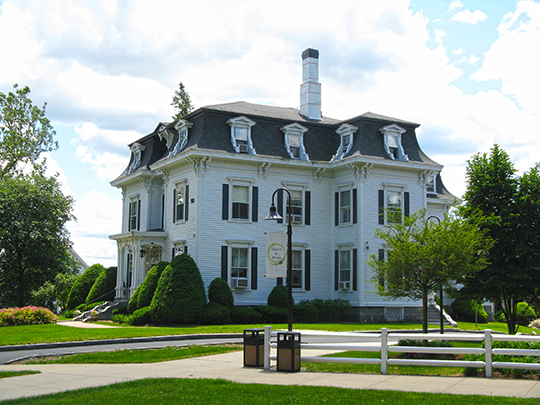 Franklin municipal offices are located at 355 East Central Street, Franklin, MA 02038; phone: 508-520-4949. Photo: Ray Mansion (Dean College Admissions Office), ca. 1870, 89 West Central Street, Franklin, MA. The historic district was listed on the National Register of Historic Places in 1975. Photographed by user:John Phelan (own work), 2010 cc-by-3.0 (creativecommons.org/licenses/by/3.0)], via Wikimedia Commons, accessed October, 2015. First settled around 1660, Franklin was incorporated in 1778. In 1660 10 men left the colony at Dedham to break ground in Wollomonopoag, as the region was then called. Serious financial difficulties, however, were encountered in bargaining with the Wampanoag Indians for the purchase of the land. Finally, Captain Thomas Willett, a noted tactician in Indian affairs, lent his able efforts and secured a purchase price of about £35. When the time came for incorporation, the town decided at first on the name of Exeter, but this choice was dropped in favor of Franklin, in honor of the great statesman, scholar and humanist. Mr. Franklin was not insensible of the honor, and, after wavering for some time between presenting a church bell or a collection of books to his municipal namesake, he decided in favor of the latter, because it is said he "considered sense more essential than sound." Industrial history began in 1713 when the falls of Mine Brook were utilized for a saw mill. Asa and Davis Thayer, 99 years later, started Franklin's first factory, and by 1865 seven local factories were turning out more than a million hats and bonnets a year. By 1937 the mill area was the industrial core of the town, surrounded by workers homes, mostly owned by themselves, small single houses with neat dooryards and gardens, lacking the drab monotony of the usual mill homes. Greenhouses, vineyards and well-cultivated farms were plentiful in the southwest section of Franklin.